How good can a $2 Churchill be? 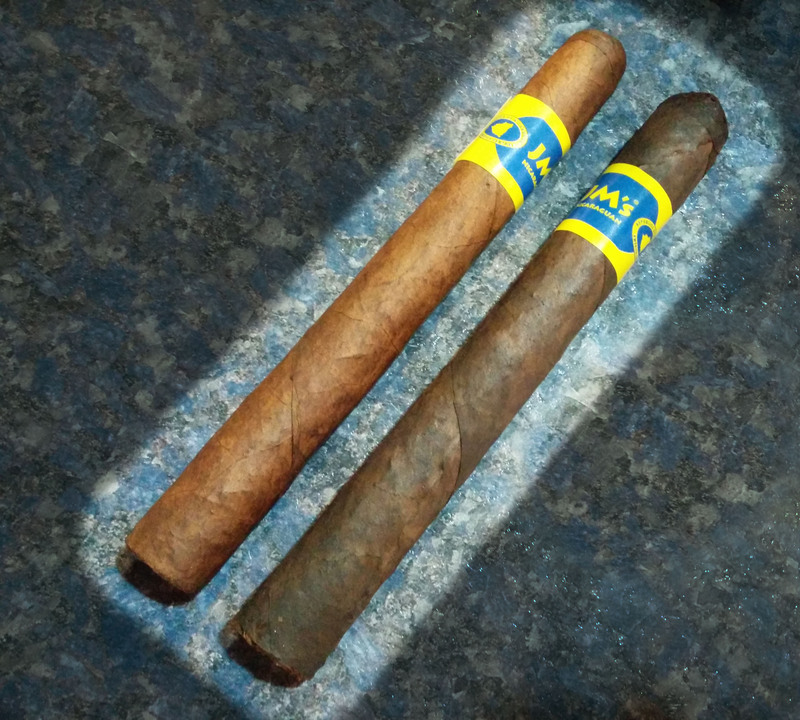 Punch and Draw are fixin’ to tell ya, as they review JM’s Nicaraguan Maduro, and explain what a durian fruit tastes like …and why that’s a good thing. Punch: JM Tobacco manufactures these by hand in Dominican Republic, featuring a Connecticut broadleaf binder around Nicaraguan filler, and a maduro wrapper. They can be found for under $3 as singles, and for $2 each in boxes of 50. This is the first cigar I’ve smoked which came pre-punched. I can only speculate that it is a convenience thing. I like punches, so this is a feature for me — but for those who like to clip and snip, you can just go right ahead and ignore the punch and cut away to your heart’s content. Draw: The JM’s Nicaraguan Maduro has a rough-hewn construction; not a complaint, but different from a cigar which is “perfectly smooth”. And it is a long fellow at 6.75″ x 50! Aroma allegedly has no impact on the flavor of a smoke, but I find it is part of the overall experience; to me, the aroma is walnutty and raisin at the foot, with the length smelling like fabric-softener dryer sheets. Of three samples I smoked, one was quite soft overall (possibly over-humidified, or simply not wrapped tight). All three I tried had cap issues, with the cap lifting from the very first toke, as if it had been licked down at the factory. Considering these are pre-punched, I expected more glue at the cap, not less. Mine is about right on draw tightness – just tight of medium. The cold-draw is French onion soup. P: The sweetness is unmistakable – sweet alfalfa. The flavor is unlike any I’ve tasted before – onion soup isn’t too far off. D: On lighting, the initial flavor is… durian! Ah ha, it is something you’ve never tasted before – we should remedy that! Tangy (mild-radish?) on tongue tip. Salty through middle and finish; hints of gunpowder residue (as the smell would taste) on finish and aftertaste. The flavor is awesome. On the second stick, I’m having smoke production issues, from too loose of a draw. Weird. P: The start is slightly sweet, no harshness, mild honeydew mellon. After ½” some smoky hardwood is trying to dominate the flavor. Three-quarter-inch in the attack is honey sweet. There is a slight black pepper on the finish. This has a nice, pleasant, mildish, somewhat complex, start. D: First third: the flavor has settled in a bit: sweet, tangy, savory, and salty. All that’s missing is fat, and you have all the essential flavors. I taste anything but tobacco, if you can imagine what I mean. The unique qualities of flavor blend so nicely that its really hard to call any one thing out; its like a Gregorian chant: many voices making the perfect tone. This settling and unity is consistent across two of three sticks, even if the exact blend is slightly different. So far, the JM’s Nicaraguan Maduro seems to idle well. There’s a slight offset on the burn line, but it is maintaining it consistently, and it’s a clean line even so. P: A mild-medium flavor intensity at this point, and a moderately complex profile. Two inches in, there is now a mild spice in the back of the throat. With the lack of “tobacco” flavor Draw suggests, this reminds me of some of the e-cigars we tried at IPCPR. My draw has opened up to a nice medium. At one point early on, this one had a ½ inch differential which corrected on it’s own. Approaching the end of the first third I had some sweet cedar for a while, but that is gone already. Now it is has blended quite a bit to a slightly sweet attack and hardwood and leather. D: At the start of the second third, it is beginning to change. The sweetness is faded from the smoke, though it lingers in the mouth still. The radish on the attack, and the onion/durian savory persist; saltiness increases overall. There is a very slight hint of pepper – white pepper? – left on the middle of my tongue near the back. I still have trouble believing I am smoking a cigar. P: At this point the sweetness is variable with each puff, yielding to a woodiness, signaling a transition that is moving toward less sweetness overall. It has smoothed out considerably, but is not quite smooth. There IS still a sweet undertone, if you look for it. So what is this durian fruit that we seem to be describing here? D: Durian fruit is a football-sized fruit covered in a thorny husk noted for its profound scent and unique flavor. It’s native to southeast Asia where it’s considered the “king of fruit”. Inside the inedible husk are several cells of creamy, pulpy husk surrounding two or three seeds each. There are many varieties of durian, but there’s really only one available on the US market. You’ve probably smelled one if you visited an Asian market and thought they had a sanitation problem. P: And this is a good thing? D: Well, if I was to describe a cigar as durian-scented, I’m either saying it smells of the taste of durian, or I’m saying the cigar stinks. The taste, and not the smell, is the thing. The taste of durian is… quite unique. To me, it tastes of caramelized yellow onions, with a kind of cream cheese undertone. There’s more to it than that – scientists have identified over 40 compounds in its scent alone – but this rich sweet savory onion taste is my best overall description. It really does taste pretty good …if you can overcome the smell. P: So it is a good thing. I wanted to find out more, so we purchased a durian fruit while Draw was visiting me in Arizona. We recorded the experience, so be sure to look for it in one of our video episodes. I have to agree with Draw’s description: the taste is quite unique, and JM’s Nicaraguan Maduro cigars have it. D: Last third: I’m feeling this. The flavor has made a continuous change since the end of the first third. Approaching the last third, there’s been more hardwood dominating the middle. The radish tang is very strong now, and is carrying through the middle and finish. The durian remains mild, mildy sweet and savory, and it is tastable in the middle and finish. That savory sweetness also lingers on the palette after. I want to be clear: the honey sweetness that Punch described is gone. This is an onion sweetness. There is also a hint of something that I can only describe as “nylon”. The flavor is “serious” now, not “carefree” and “light” as in the beginning… but, I still can’t say it’s a cigar. The cigar pepper and tobacco flavor – that I’m used to, that I expect – simply aren’t there. P: Yes, more of an onion sweetness on the attack, followed by smoky tobacco with cedar. I’m feeling something right now; it can’t be the cigar, can it? Now I’m hard pressed to detect any sweetness at all. I will say it has smoothed out to a nice monotone hardwood. With two-inches remaining, just before I put it down, there are occasional notes of meat, along with pepper, and I’m getting a nice menthol on the finish. A nice refreshing note to end on. D: Despite some burn issues, I am wanting to keep smoking this, keep tasting this all the way to the nub. That is a challenge because I have to keep stoking it, but then go easy to keep it cool. There’s still a slight durian onion – very faint; there’s radish on the attack – more than at the beginning of this particular stick, in fact – and regrettably some cedar. There’s still a hint of nylon. Purging here brings back more of the durian, and eliminates the cedar, as well as helps with the stoking. P: Burn it. This had enough complexity to keep it interesting: medium flavor intensity with durian, onion, salty leather, smoky hardwood, cedar and menthol. The flavor profile was much better than I would expect for a $2 – $3 cigar. Where the low cost was evident was in the construction and consistency. Of the three I smoked for this review the draw ranged from medium-tight to tight-plus. We both had cap issues on more than one of our sticks. The overall appearance of these is rustic; with prominent veins and a very irregular surface to the wrapper. I’m sure that the rollers are kicking these out at light speed to keep the cost down. But since no one generally buys cigars to frame or put on display this is a good trade off. One could easily get a box of these to mix into rotation as an everyday smoke, without straining their stogie budget. D: Burn it! There’s a lot of flavor in these cigars, and you′re going to get sufficient variety between one-another to keep the exploration interesting. At their cost point, there’s no reason not to have them at hand. Punch commented on the source of value for these sticks; I have one more to add: one of the three that I smoked was way outside profile of the other two. Including it’s overall appearance… it seems that a different stick received the maduro band. Because it was part of the review-set, I smoked it as a “maduro” and was very disappointed in how it wasn’t the same flavor as the other two. I had occasional burn issues across all three I smoked, but that could have been the fault of my storage and humidification. Of the maduros: mild-medium complex flavor and medium strength, 60–75 minutes smoking time. Very enjoyable. This review was based on smoking three sticks each, which were given to us by The JM Tobacco Company’s President, Anto Mahroukian, for the purpose of reviewing. Watch for us to follow this review with another at six-months and 18-months. I smoke a tone of cigars but when my money is low I fall to JMs nic. Churchill. I never had a draw issue and maybe it does have uneven burn issues at times but it’s easily touched up with the torch. I have been smoking then a omg while and in my experience you cannot find a better cheap cigar for the price.